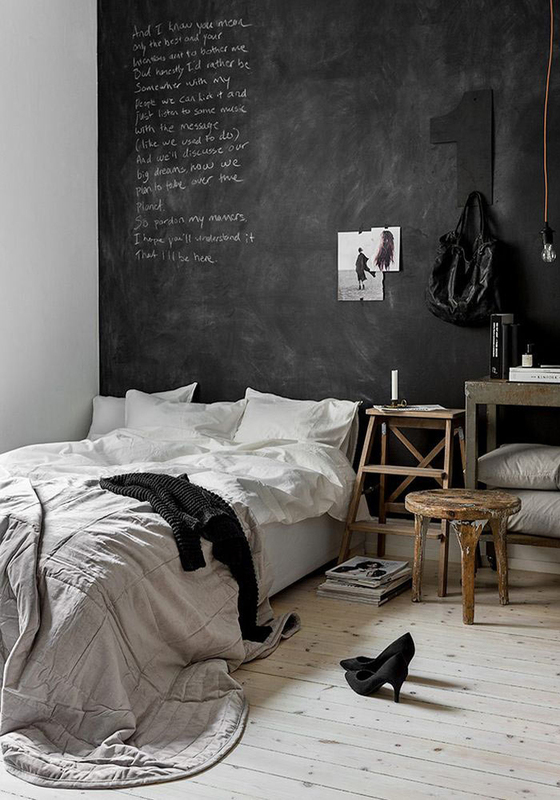 We often see black chalkboard walls in kitchens, workspaces or even the kids bedrooms but how about using it in your own bedroom… Would you be open to the idea? I have used Farrow & Ball’s Down Pipe in our bedroom in France (you can see more photos on Instagram) which creates a nice, design statement statement in a room that was fairly plain to begin with, with the exception of the French windows leading onto the garden and which are a nice feature. If you’re not ready to make the jump to a black chalkboard wall, I have compiled a lot of beautiful bedrooms painted with dark walls on Pinterest. Love it or hate it, once you’ve written a few messages and then wipe them off to write new ones, chalk adds texture and character to a wall and a room like nothing else does. I say love or hate, because personally, I love the look and texture of chalk writing on a wall and it makes a really nice background to take portraits. However, I’m not a big fan of the feeling of chalk on my fingers or chalk dust. It may be a small detail for some of you and one that I’m adding it to “the list of things I need to get over with” but it’s pretty much what stopped until then. Then, I look at these beautifully styled bedrooms, their crisp white cotton bed linen, this gorgeous oversized knit blanket and think that it would actually look really really nice to spend some time in a bedroom like this, don’t you think!? What a wonderful idea and so easy to apply and makes such a massive difference. Thank you for this amazing tip. Love how you can write creative words whenever you want as well, a win win in my eyes. I fancy it a lot! I’m just a bit worried I’ll get allergies or something because of the chalk dust, but I’d still consider trying out the idea. Hi Isadora, did you give it a go in the end?